Linuxslaves.com - Looking for best torrent client in Ubuntu?. Give this app a try. qBittorrent is an advanced, free, open source application (as the name suggests) based on Qt4 toolkit and libtorrent-rasterbar library. 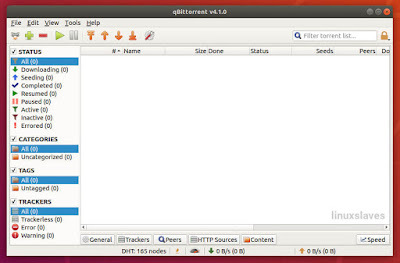 The qBittorrent runs on all major OS including GNU/Linux, Mac OS X, Windows, OS/2, FreeBSD. This app maybe the best alternative to µtorrent. There's an official qBittorrent PPA that prodives the latest package for Ubuntu 16.04, Ubuntu 17.10, Ubuntu 18.04, and derivatives (Mint, Elementary OS, etc). Optionally, you can use Software Updater to upgrade from previous release. These were all how to install qBittorrent in Linux : Ubuntu, and derivatives system like Linux Mint and Elementary OS. Thanks for reading!.